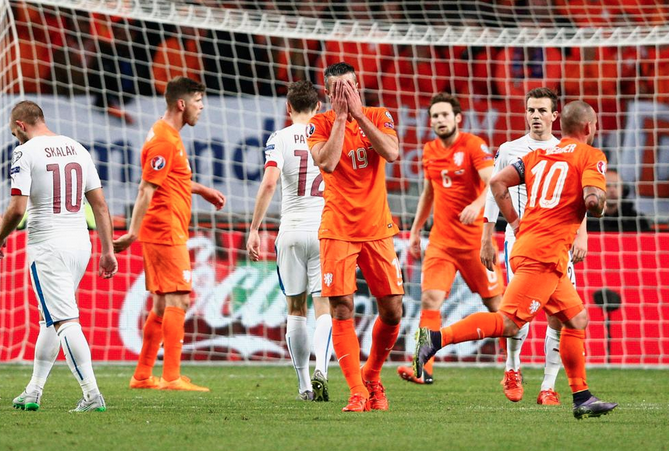 Robin Van Persie's poor season continues as the former Arsenal striker scored the own goal that ended the Dutch team's hope of qualifying for Euro 2016. At 2-0 down to the Czech Republic, needing a win to put some pressure on Turkey for third spot in Group A, Coach Danny Blind brought on RVP. The Czechs went down to 10 men but still Holland struggle to get going in the game and on 66 minutes Robin van Persie scored a bullet own goal header to confirm defeat.